Our complete manicure and pedicure systems are now available in a convenient packette box! Sized for single use, you can control portions, take on the go or affordably sample all six treatement- based fragrances! Each packette box includes one of each: ( 0.5 oz x 4 ). 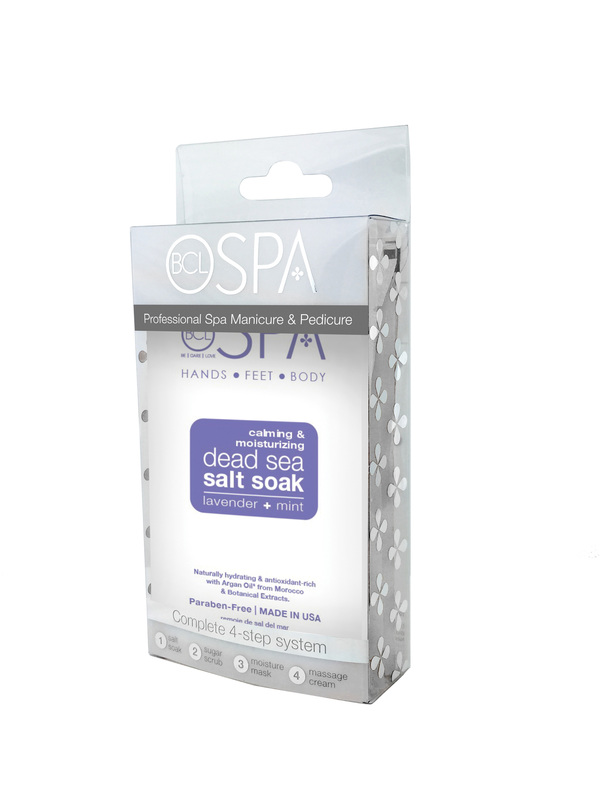 Step 1 : Dead Sea Salt Soak, Step 2 : Sugar Scrub, Step 3 : Moisture Mask, Step 4 : Massage Cream. Lavender is incredibly healing to the skin, while calming anxiety, tension, and restlessness for a soothing, peaceful night's sleep. This non-greasy, easily absorbed massage oil provides an experience of total relaxation as it soothes away the stresses and tensions of the day. This luxurious sugarscrub is a gentle exfoliant for the hands, feet, & body. Step 1 : Lavendar & Mint Dead Sea Salk Soak , Step 3 : Lavendar & Mint Moisture Mask and Step 4 : Lavendar & Mint Massage Cream. Also available in 64 oz ( SPA50014) et 8 oz ( SPA53202 ).